You know how sometimes you wish that everyone loved books as much as you do? That everyone loved books and talked about them and valued their contents as much as you? That everyone thought reading was one of life’s greatest pleasures and wanted to spend as much time immersed in a fictional world as you do? In addition to five weeks’ holiday a year, everyone would be granted an annual Reading Week to do nothing but bathe in books (not literally, obviously, unless that really took your fancy). A bit like the reading weeks you had at school or university except during these people would actually read rather than watch daytime TV with a hangover for seven days. Reading, all day, every day, for an entire week. Free childcare would be provided for parents during Reading Week (or else, let’s face it, they wouldn’t really get much reading done at all). All schools would be staffed with permanent Book Magicians whose sole job would be to read with children and introduce them to new books and provide space for them to discover the magic of reading. 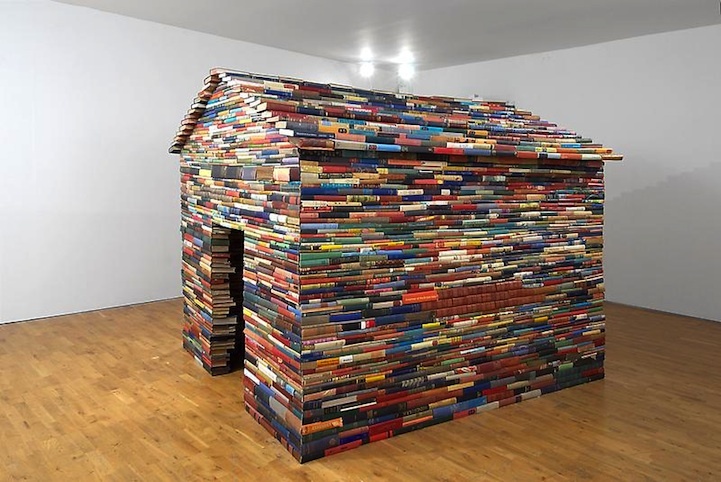 And all classrooms would have a playhouse made of books like this one. Every town would have a library. And those libraries would be the hub of the community. And the idea of anyone ever closing one down would be so absurd that the very thought would simply make people laugh because it Just Wouldn’t Happen. And some of those libraries would look like one below. Book shops would be even more ubiquitous than pubs. And they would be open every evening to host book groups and literary discussions and author events. And these events would be packed because they would be where you’d meet interesting people and have interesting discussions and they would be FUN. It would be completely acceptable to paper the interior of your house in wallpaper featuring book jackets. Specialist manufacturers would create bespoke wallpaper featuring your favourite book covers. And these manufacturers would never go out of business. Water-cooler moments at work would not only be about what people watched on TV last night or the latest celebrity wedding or what you cooked for dinner. There would be impassioned, excited discussions about what people had read overnight. And everyone would know that these were the most enriching conversations they’d have all day. So, that’s what my Bibliophile’s Utopia would look like. If your book utopia could be realised, what would yours include?